This is my sample sample disaster recovery plan, along with a few tips to assemble a disaster supplies kit. What I am trying to accomplish with this little guide, is just to bring some awareness to a definite reality we could all face. (we all have heard about what has recently happened in Haiti and Chile '). I spent quite a bit of time glued to the news, I could not believe the devastation and lack of resources, everyone was affected, rich or poor, I could not help but think..what if..what if it happened here . Here can be any where, and this is mother nature, it is out of our control. Is there anything that the people of Haiti could have done? Like I said, this really got me thinking, so lets go through it quickly. First lets imagine that it is three o'clock in the morning and you are awakened to an earthquake, your house is shaking, are you ready for something like this? Panic was my first thought, then run out side to the middle of the yard and watch as your home crumbles to the ground. Now what? Its dark, even if it was not, the dust around would be so thick it would take hours to settle. There are no lights anywhere, the roads are ripped up. It is very obvious right away that this situation will not be resolved to even a point of basic services or transportation at all for at least a week, and probably a lot longer for any kind of normality again. So now what? Daylight is breaking, are we prepared to survive here in our yards for a week, we do not even want to go back into our homes or whats left of them for fear of aftershocks. One of the first things you would notice are all the typical things that we take for granted everyday. No bathroom, No refrigeration, No electricity, No phone, No TV So what are we doomed? I think not. We have been preparing all of our lives for bad situations to arise, its just that most of us have not prepared for this one, or something similar. Let me explain, we buy auto insurance because it could happen, we could be involved in an accident, We buy life insurance, we buy home insurance … Hang on I promise I am not selling insurance, just trying to get the point across , we like to be prepared, it gives some amount of security and comfort. OK back to that dreaded morning in the middle of my back yard everything in ruins. Here's my first tip, if you are like me you might have a camper, motor home, travel trailer or even a boat that is set up for overnight, well if its in storage some where, you might think of bringing it home and using it as an emergency Shelter should you ever need it. Make sure that it is located in your yard where no falling buildings or trees could damage it, also make sure it is clear of power lines. Now that it is home and in a safe place, make sure you get it ready, plan for at least a full week, fill propane tanks, water storage, empty septic, and some other supplies I am about to mention. For those of you that do not have one of these camping units, there are some good alternatives, that will not cost much, you may already have these items and you just need to organize. Start to assemble a disaster supplies kit, a large duffel bag or rubber maid container, but make sure you can access it easy enough. You are gonna need, a tent or tarp, some kind of shelter, some cots, blankets or sleeping bags, and a portable shower and toilet. OK that's shelter and sleeping, now look at survival and safety gear, cookware and utensils, water purifier and some bottled water, at least a few gallons per person per day. Food rations and a first aid kit. Storage containers will be very important, liquid and food storage, supply and medical storage, and gas or fuel supply storage. This is just a few basic guide lines that could help, your investment would be very minimal, do not be left standing out there with nothing. Take a bit of time, include the family, be prepared, I followed my own advice this time, I feel more secure knowing that I am some what prepared to help myself and maybe some others. We all hope for the best … but we should prepare for the worst. 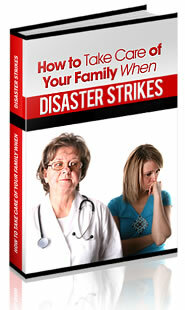 « Earthquakes, Tornados, Floods, Terrorist Attacks – Are You Prepared?